We recognise the benefit of fostering and maintaining strong relationships with our stakeholders through transparent and effective communication and we are intent on sustaining our established credibility and rapport with them. We have identified our stakeholders as those persons, groups or organisations who are directly impacted by our activities, as well as those persons, groups or organisations who can reasonably be foreseen to be impacted by our activities. A structured system of engagement exists to ensure the timeous communication of accurate and relevant information to, and interaction with, each stakeholder group in a consistent manner. The means by which we engage our key stakeholders is available online. The Board takes overall responsibility for ensuring a stakeholder-inclusive governance approach and has, for this purpose, approved the Group's stakeholder engagement policy (also available online). Executive management has been entrusted with the responsibility for implementing this policy and for maintaining a robust and consistent system of communication with the identified stakeholder groups. A wide range of regular, structured and ad hoc engagements take place at various levels in the organisation. Stakeholder engagement is a standing agenda item at scheduled meetings of the Board. Executive management submits quarterly stakeholder engagement reports detailing notable engagements with the Group's key stakeholders and any material topics or matters of concern which may have arisen are considered under this item. Management responds to material issues raised by stakeholders, as appropriate, in the ordinary course of business. We undertook a strategic review of our global nutritionals business. This entailed engagement with a number of interested parties. Ultimately, an agreement to divest of our global nutritionals business to the Lactalis Group, a leading multinational dairy corporation based in Laval, France, for a consideration of EUR739,8 million was concluded after the 2018 financial year-end. We had negotiated and concluded an agreement with AstraZeneca in terms whereof we acquired the residual rights to AstraZeneca’s global anaesthetic portfolio (excluding certain territories, most notably the USA). We had already acquired the commercialisation rights to this portfolio in September 2016. We addressed concerns and engaged with customers and patients in respect of disruptions in supply from the AZ production network resulting in certain anaesthetic products not being available in a number of territories. We also worked pro-actively with AZ to manage constrained supply and to monitor steps to remediate the situation. Extensive engagements were undertaken with the Group’s funders in order to successfully close multi-currency syndicated facilities equivalent to approximately EUR3,4 billion. As reported previously, the age and design of the Moleneind facility that was acquired from MSD in 2013 presented an inherently high SHE risk. Since our acquisition of the site, we have implemented a number of risk mitigations to reduce the SHE risk and have worked proactively with the authorities to address concerns. During the year, we transferred certain of the highest risk chemical operations from the Moleneind facility to the De Geer facility, as well as to FCC and a third party, with only biochemical and lower risk chemical production remaining at the Moleneind site. We decommissioned a production facility and a solvent recovery unit at the Moleneind site and completed the construction of a modern multipurpose solvent recovery unit at the De Geer site. Aspen’s R1 billion Port Elizabeth-based high containment facility was opened in May 2018 and initial production in this facility is planned for Alkeran, Leukeran, Purinethol, Imuran and Benztropine. We engaged with pharmaceutical regulators from many countries with the objective of ensuring efficient and timely product registrations, ongoing accreditation of our manufacturing facilities and to facilitate site inspections by these regulators on a regular basis. Aspen continues to cooperate and engage both the European Commission, which is investigating certain pricing aspects related to Aspen’s portfolio of oncology products in Europe, and the United Kingdom’s Competition and Markets Authority, which is investigating the pricing of an Aspen product in that country. 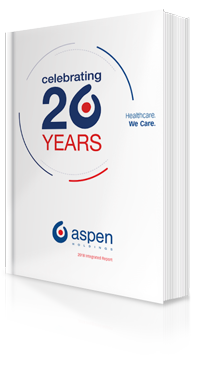 The pricing enquiry in Italy in respect of Aspen’s portfolio of oncology products sold in that country was settled after an agreement was reached with the Italian Medicines Agency (“AIFA”). Discussions, correspondence and meetings with tax authorities, partially necessitated by the global increase in scrutiny on taxation. The executive directors and the Investor Relations Manager undertook many interviews with the members of the investment community. Aspen hosted an Investor Day at the Durban corporate office at which investors and analysts were addressed by members of the Aspen executive team. In addition, the executive directors went on an investor roadshow to the US and UK to engage with current and prospective institutional investors in these countries.